Introduction to Murray Zimiles. 2:15 min. Photos: Raymond Elman. Murray Zimiles (b.1941) is a painter, printmaker, curator and author. He was a professor of art at Purchase College, State University of New York, from 1977-2014. He earned his BFA in painting and printmaking from the University of Illinois, and his MFA from Cornell University. Post graduate study of printmaking at the Ecole Nationale Superior des Beaux Art, and at private workshops in Paris, France, lead Zimiles to co-author two books on lithography. In 2007, he was elected a member of the National Academy, NY. Zimiles was the Guest Curator at the American Folk Art Museum and authored a book/catalogue publication titled Gilded Lions and Jeweled Horses. In 2008, the book won the National Jewish Book Award in the Visual Arts category. Zimiles has participated in numerous solo and group exhibitions since 1965. In 2003, a mid-career retrospective of his paintings and drawings was held at the Neuberger Museum of Art, Purchase, NY. 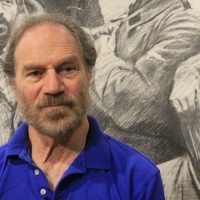 In October 2014 and 2017, he had a major exhibitions of his Holocaust paintings, drawings, and prints at the Florida Holocaust Museum which recently acquired approximately 140 pictures executed from 1984-91. In 2015 the Shchukin Gallery, New York, held a solo exhibition, “Murray Zimiles: Reimagining Landscape Painting for the XXl Century.” In 2016, his painting triptych, 911, was acquired by the 911 Memorial and Museum, NY. In March 2017 an exhibition of his paintings was held at the Shchukin Gallery, Paris, France. His work is held widely within private and museum collections throughout the world, notably the Museum of Modern Art, NY; the Brooklyn Museum, NY; the Jewish Museum, NY; the New York Public Library, NY; the Neuberger Museum, Purchase, NY; the Philadelphia Museum of Art; Wesleyan University; the Portland Museum of Art; the Museum of Modern Art, Haifa, Israel; the Tel Aviv Museum, Israel; the National Collection, Washington, DC; University of New South Wales, Sydney, Australia; and the Ronald Lauder Collection, New York, 911 Memorial and Museum, NY. OVERCOMES CHALLENGES TO SUCCEED: 1:41 min. What’s your earliest memory of art in any form? VALUES LEARNING PROCESS: 2:30 min. What did you learn in school in Illinois, Cornell, & Paris that still informs you today? Describe the arc of your career. You are very skilled at drawing, printmaking, and painting. Do you prefer one discipline over the others? INSIGHT & INSPIRATION: 1:09 min. UNDERSTANDS THE AUDIENCE’S PERSPECTIVE: 0:58 sec. Your Holocaust series is very impactful. Have you watched people reacting to your images, and has that influenced your work? INSIGHT & INSPIRATION: 2:20 min. Some of your imagery looks familiar because of old Holocaust photos that the entire world has seen, but you have combined and arranged images in a way that is much more dramatic and impactful. DEVELOP A VOICE: 2:57 min. What are your criteria for a successful outcome for a piece? How does you son relate to this body of work? What is the role of serendipity in your work? VALUES LEARNING PROCESS: 1:51 min. What has teaching art at a university meant to you? CREATES A UNIQUE PERSONAL BRAND: 3:10 min. How have you chosen art projects once you completed the Holocaust series? CREATES A UNIQUE PERSONAL BRAND: 1:39 min. Most of your work that I’ve seen incorporates figurative and abstract elements. Do critics keep trying to pigeon-hole your work into a genre? CREATES A UNIQUE PERSONAL BRAND: 3:05 min. Once you completed the Holocaust series, what was your challenge moving forward?